Deep learning doesn’t have to be intimidating. Until recently, this machine-learning method required years of study, but with frameworks such as Keras and Tensorflow, software engineers without a background in machine learning can quickly enter the field. 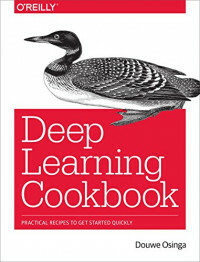 With the recipes in this cookbook, you’ll learn how to solve deep-learning problems for classifying and generating text, images, and music. Each chapter consists of several recipes needed to complete a single project, such as training a music recommending system. Author Douwe Osinga also provides a chapter with half a dozen techniques to help you if you’re stuck. Examples are written in Python with code available on GitHub as a set of Python notebooks.